Moving into an assisted living facility is a big step for many seniors in America, and it can’t be easy to give up your familiar, friendly neighborhood life for an often hospital-like environment. 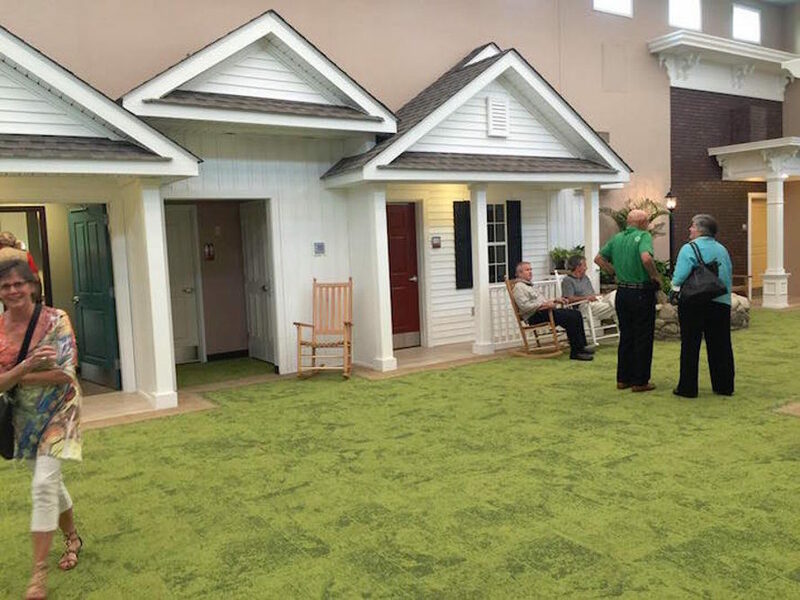 The Lantern, an Ohio-based company with centers in three cities, offers a cheerful alternative, with hallways built to resemble a cute residential street, complete with tiny front porches and rocking chairs. Hallway carpets are designed to recall grassy paths and small ‘water’ features. In the background, recorded birdsongs play and a high-tech ceiling mimics the changing sky. For residents, this is the next best thing to the homes they had to leave behind. The Lantern operates three locations in the towns of Madison, South Russell, and Saybrook in the Chagrin Valley area of Ohio, near Cleveland. Each is fashioned with an interior that looks more like a movie set than an assisted living facility. Some halls of the Lantern look like a 1940s neighborhood (where residents now in their nineties might have lived when they were 20-somethings), while other areas were designed to mimic a downtown shopping district, with street lamps and cafe tables. CEO Jean Makesh had a vision for a different type of elderly care while he was working as an occupational therapist at large chain of assisted living facilities. 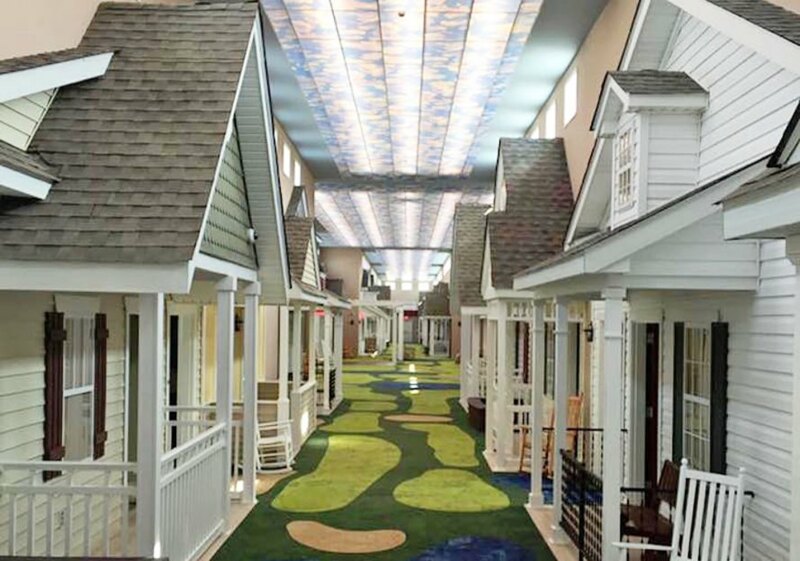 True to his dream, the Lantern offers the same wide array of therapeutic care patients and their families expect in an assisted living facility, but its physical design widely differs from other residential care programs. Using biophilic design, the Lantern facilities were created specifically to support a normal, active lifestyle with minimal disruption to patients’ habits and routines. Environments like these are scientifically linked to repair some memory loss in patients with dementia and Alzheimer’s. The Lantern takes their elder care even further, by offering services that are not found in many assisted living facilities, such as a full-service salon with spa treatments, massage therapy, aerobics, as well as support for residents to maintain as much autonomy as possible related to daily tasks, like personal care. The facilities also feature a 24-hour bistro onsite serving drinks and snacks, a movie theater, fitness center, library, and more. The Lantern operates three locations in the towns of Madison, South Russell, and Saybrook in the Chagrin Valley area of Ohio, near Cleveland. Each is fashioned with an interior that looks more like a movie set than an assisted living facility. Some halls of the Lantern look like a 1940s neighborhood (where residents now in their nineties might have lived when they were 20-somethings), while other areas were designed to mimic a downtown shopping district, with street lamps and cafe tables. CEO Jean Makesh had a vision for a different type of elderly care while he was working as an occupational therapist at large chain of assisted living facilities. 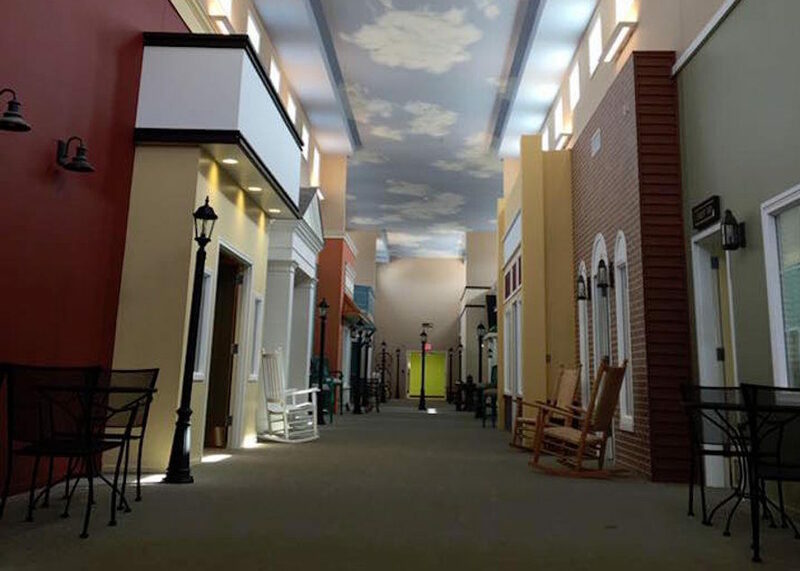 True to his dream, the Lantern offers the same wide array of therapeutic care patients and their families expect in an assisted living facility, but its physical design widely differs from other residential care programs. Using biophilic design, the Lantern facilities were created specifically to support a normal, active lifestyle with minimal disruption to patients’ habits and routines. Environments like these are scientifically linked to improved memory loss in patients with dementia and Alzheimer’s. The Lantern takes their elder care even further, by offering services that are not found in many assisted living facilities, such as a full-service salon with spa treatments, massage therapy, aerobics, as well as support for residents to maintain as much autonomy as possible related to daily tasks, like personal care. The facilities also feature a 24-hour bistro onsite serving drinks and snacks, a movie theater, fitness center, library, and more.